I'm always appreciative of authors that teach as they write. Nadia Hashimi appeared on the literary scene last year with The Pearl That Broke Its Shell, a novel that delved into the lives of girls growing up in Afghanistan living as bacha posh. 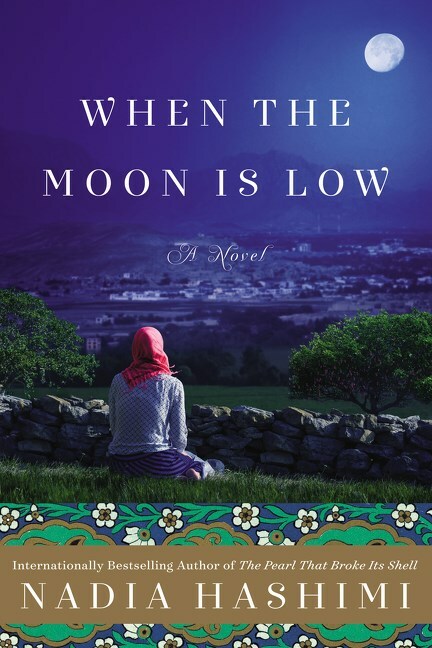 I was immediately drawn into the lives of the characters in The Pearl and with When the Moon is Low, Hashimi once again pulls readers into the stressful and chaotic lives of her characters. When first we meet Fereiba, she's a Cinderella-like character. In an attempt to find a mother figure for newborn Fereiba and her two year old brother, Asad, her father marries KokoGul. While Asad, as a boy, is looked upon favorably, Fereiba becomes a bit of a whipping post for KokoGul, who goes on to birth her own daughters. Kept home for years to assist KokoGul with housework, Fereiba watches all of her younger sisters and brother attend school. Is it because KokoGul really needs help around the house or is it because she wants to limit Fereiba's future? I would say both. KokoGul strikes me has a hateful and petty character. We see this when Fereiba is being courted by a neighbor boy, but KokoGul pushes Najiba, her daughter by birth, forward for marriage instead. Again and again, we see Fereiba face adversity, but we also see her find a way to work around her circumstances and that will serve her well in the long run. Fereiba marries Mahmoud, an engineer, who is much better suited for her than her former suitors. With him, they have a son, Saleem, and daughter, Samira. Life in Kabul takes a turn with the rise of the Taliban and Fereiba's family finds that their only means of survival is fleeing their home. When the Moon is Low follows Fereiba's journey with her children, taking them from Afghanistan to Iran, Turkey, Greece and hopefully, eventually, England. Her grit and determination are passed on to her children, Saleem in particular, who takes on responsibility for the family when his mother needs him to do so, but also Samira in her own way. Samira was just nine years old on that night. She was an extension of me. Her moods ebbed and flowed in response to my moods, just as the tides respond to the moon. If I brooded, Samira quieted, blowing her dark bangs away from her crinkled forehead. If I was happy, my daughter walked with a skip in her step. I loved this book. Told from the perspective of Saleem and Fereiba, Hashimi brings us the story of immigrants from a war torn country with such care and concern. I found myself shaking my head, realizing that I'd never really given much thought to how bad things were in other countries or the difficulties citizens had in escaping the oppressive regimes. As long as Hashimi keeps exposing and exploring such fascinating topics, I'll keep reading.